In some ways living in Ukraine is not dissimilar from living in western Europe or even the United States: there are lots of cars, supermarkets, museums and other cultural attractions. But upon closer scrutiny Ukraine is still very much a developing country: public transport is slow, communities work and eat based on the seasonal calendar, most people hand-wash their clothes. That said, Ukraine has many interesting things to offer for the traveler. Below are a few recommendations based on my experiences over the past the ten months. 1. How to Travel: Buses and trains are numerous and are the cheapest ways to travel around the country. Be warned, travel is not fast. If you are torn between bus and train, buses tend to be slightly (30-60 minutes) quicker but slightly more expensive. Trains, though slower, are cheaper and more comfortable: in coupe (second class) and platzcart (third class) you are provided with bedding and can lie down and sleep (most long-distance trains are overnight). 2. Kyiv: Ukraine’s capital holds a few treasures worth seeing. Spend a day or two exploring the cathedrals – especially St. Sophia’s and St. Michael’s – and strolling down cobblestoned Andriyivs’ka Street, pausing to check out souvenir vendors. 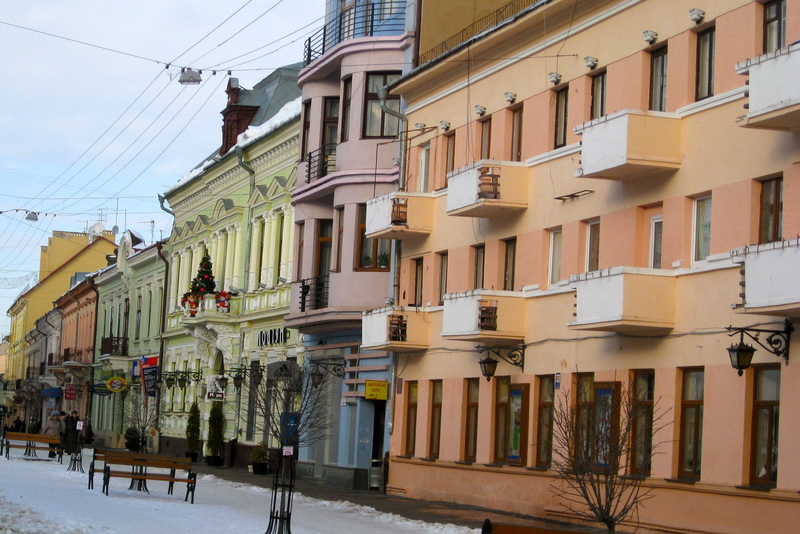 Walk down Khreshchatik, Kyiv’s main drag, lined with expensive stores and restaurants. Plan your walk for the weekend, when Khreshchatik is closed to cars between the Lenin statue and Maidan Nezalezhnosti (Independence Square). St. Michael’s Cathedral, Kyiv 2b. Eating in Kyiv is expensive. The cheapest non-supermarket food I have found in the city is a standard stop for traveling Peace Corps Volunteers who want a fast, cheap, filling meal on a budget. It’s a falafel restaurant on Starvoksal’na street, not far from the train station. Delicious falafel wraps start at 20 UAH (about $2.50). 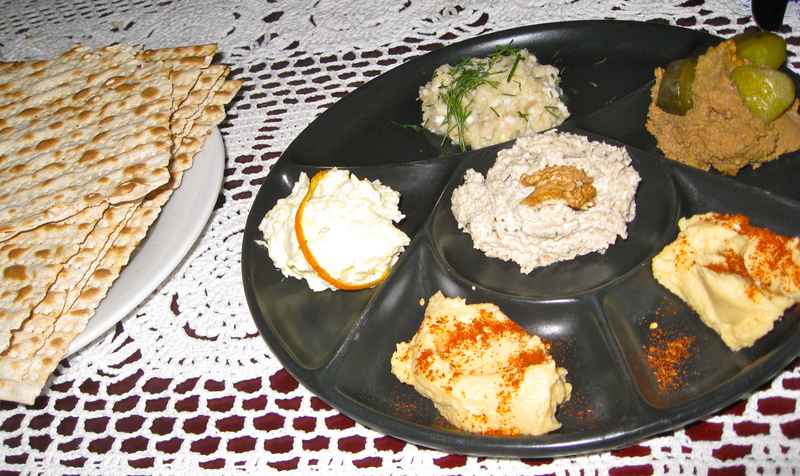 And they have hummus! 3. Because restaurants in Ukraine are expensive in most towns and cities, it is wise to shop at bazaars for the freshest and cheapest natural products. Bazaars are everywhere and have wide selections of just about any food item you could want. To save some money, stock up at the bazaar and have a picnic. Another cheaper option is finding a cafeteria (yidalnia) where you can sample traditional Ukrainian food at a lower price than a restaurant. 4. That said, it is fun to splurge once in a while at a restaurant. 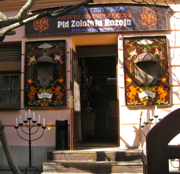 In L’viv I ate the best – and most expensive – restaurant meal I have had in Ukraine at a Jewish-themed restaurant, Pid Zolotoju Rozoju (“At the Golden Rose”). Apparently it is one of quite a few themed restaurants around the city. The premise at this one is that, after the meal, you haggle for the bill with your waiter; I think it attempts to (semi-insensitively) recreate some sort of “Jewish” custom. No prices are listed on the menu, so it is up to your negotiation skills to fix the price. My friends and I agreed on a maximum we could pay and our waiter opened negotiations at a ridiculously high price. We managed to get him to lower it by alternating bids with reasons like, “We’re poor volunteers here, teaching English! We love Ukraine!” It was unclear whether the waiter had previously set the bill total; it seemed so because eventually we got him down to a price that he would not go below. The haggling episode was jocular, and though the meal was expensive we were satisfied. (Side note: I am sure this system traps more than a few faint-hearted customers who give up negotiating at some point.) 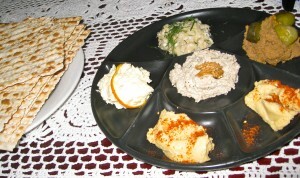 The service was excellent, and the food was delicious; I recommend the “Jewish spreads” sampler and the spiced wine. 6. 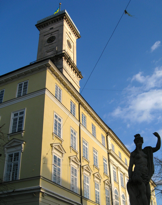 From L’viv, since you are in the west, I recommend heading down to Chernivtsi, capital of the Chernivets’ka Oblast and once part of the Austro-Hungarian Empire (as was much of the rest of western Ukraine). Like L’viv, Chernivtsi has beautiful architecture and even an abandoned Gothic-style German cathedral. In Chernivtsi you must walk through Shevchenko Park and down Kobalans’ka Street, the city’s pedestrian street in the center. On Kobalans’ka, spend an hour or two in the regional historical museum to gaze at old maps, tools, art, and traditional Ukrainian costumes. The docents are helpful and knowledgeable. If you get hungry for lunch, stop at Café Efes, just off Soborna Ploshcha (Cathedral Square). 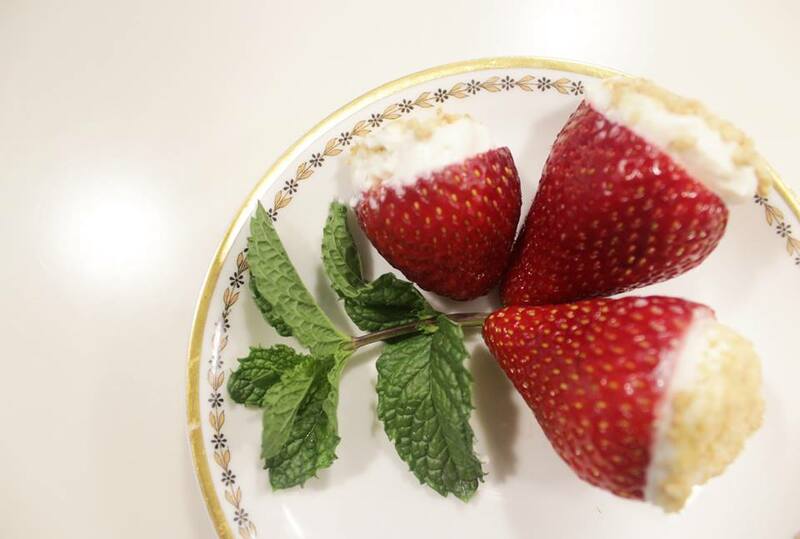 There is traditional and non-traditional cuisine, the pizza has real parmesan cheese, and the prices are reasonable for travelers on a budget. 7. Climb Mount Hoverla, Ukraine’s highest mountain at 2,061 meters. It is in the Carpathian Mountains of western Ukraine. It’s an easy day-hike and the views are gorgeous. My only advice: don’t do it in March! It is still quite cold, the lower trails through the woods were icy, and there was still slippery snow above the tree line. We were not even allowed to advance to the true summit because of the wind and ice at the top. 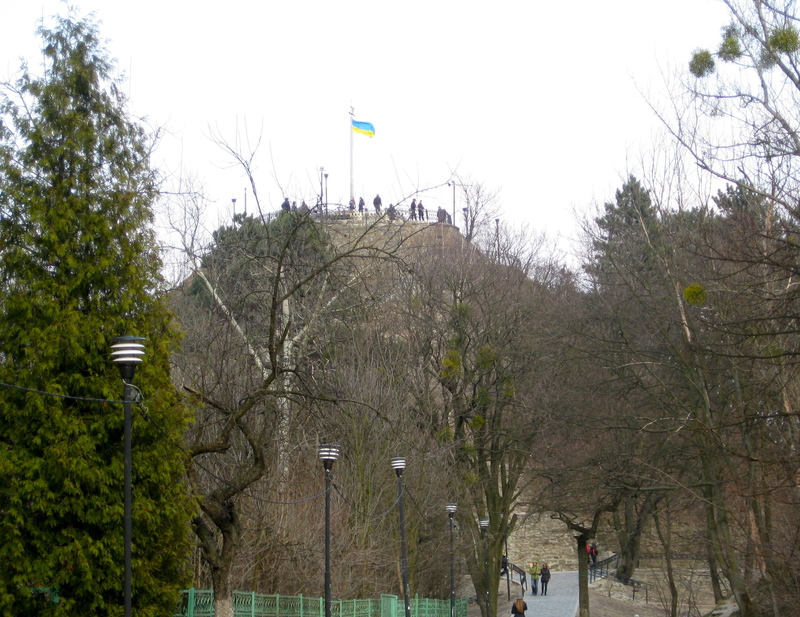 I did the hike with some friends – and about 95 other Peace Corps Volunteers, along with 4-500 Ukrainians – as part of a big event organized by a Volunteer and her NGO. 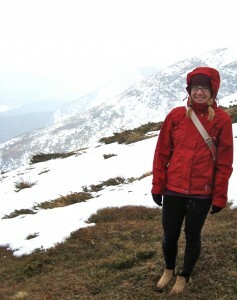 The Ukrainians arrived decked out in snow suits and heavy hiking boots, and some even had ski poles. Most of us Volunteers had not been quite as well-informed of the weather; my thin cotton leggings did not cut it at the top. This would be a fantastic hike in the summer, and I hope to do it next year in the warm months.